Two types of magnifiers are available: a reading lens that clips onto the thermometer and a hand lens. 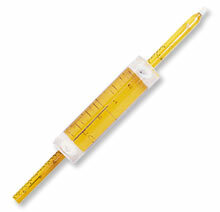 The 3" plastic magnifier clips directly onto the thermometer and provides a useful reading aid. The handheld lens is 21/4" long by 1" in diameter. The focal length is 3", field diameter is 3/4", magnification is 6x. This lens is excellent for estimating intergraduations.